Just over a year ago, the Starting Gate, the banquet component of the GreatHorse golf and lifestyle club, was merely studs on a foundation. But weddings were already being booked for the facility, said GreatHorse General Manager Bryan Smithwick, because those who saw what was done with the course and clubhouse understood that the same attention to detail would prevail in the banquet hall. And the view from the top of the mountain didn’t hurt, either. As he talked about the Starting Gate, the banquet-facility component of GreatHorse, the exclusive golf and lifestyle club in Hampden opened in 2015, Bryan Smithwick drew a straight line to Disney. Well … maybe it wasn’t a straight line, but he nonetheless got his point across. And it is, or will be, like that with the Starting Gate, he predicts, acknowledging that this analogy is far from perfect, but for the purposes of this discussion, it works. GreatHorse and its banquet facility are, indeed, off the beaten path. The road in front of the picturesque club has two lanes with a solid yellow line in the middle, and if you’re starting from virtually anywhere but Hampden, Wilbraham, East Longmeadow, or Somers, Conn., it takes a while to get to that road. This is where that Disney analogy comes in, said Smithwick, Greathorse’s general manager, adding that this facility is well worth the trouble of getting to. It starts with the view from the top of the hill and then out the windows of the Starting Gate, he told BusinessWest, and it continues with the hall itself, its large decks with retractable roofs and side panels, the on-site wedding garden, the extremely spacious bridal suite, the food, a ‘Cadillac golf cart’ to help get the bridal couple around, and … on he went. As did Cathy Stephens, director of catering sales for GreatHorse, who, like Smithwick, said a number of constituencies are discovering this unique facility. They include engaged couples, meeting and event planners, business owners looking for a site for a retreat, holiday party schedulers, and more. See: Banquet Facilities in Western Mass. Opened just before the holidays last year, the facility started attracting clients when it was little more than studs on a foundation, said Smithwick. And the course and clubhouse then surrounding the building under construction — not to mention those stunning views (it was early fall by then) — were big reasons why. “After having the opportunity to see the clubhouse, people felt confident that the same quality would be distilled into the Starting Gate,” he explained, adding that couples were putting non-refundable deposits down for weddings months before the structure was ready for occupancy. The Starting Gate would go on to book nearly 30 weddings for 2016, a solid start, according to its managers, with 22 already on the books for next year, a few for 2018, and even one for 2019. But while weddings will be a major focus for this business, the Starting Gate is looking to host a wide range of events. They include holiday parties — many are already booked for this December — as well as corporate outings, business meetings (the East of the River Chamber has already staged a lunch there, for example), and more. 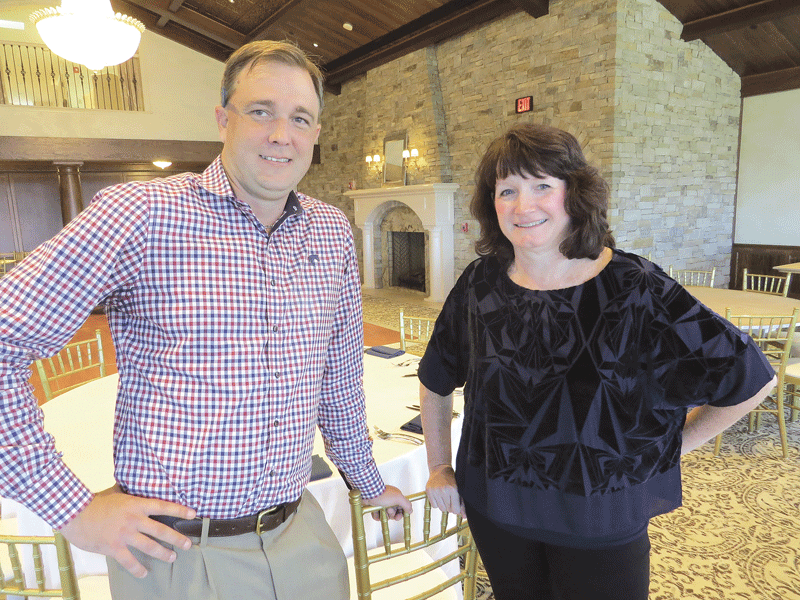 Cathy Stephens and Bryan Smithwick say the Starting Gate is off to a fast start in the region’s highly competitive market for banquets and weddings. And while the facility boasts one-stop shopping as one of its assets, especially for weddings, as we’ll see later, management plans to complement this by marketing the Starting Gate in conjunction with nearby Sonny’s Place (in Somers), another venture owned by the Antonacci family, said Smithwick. Sonny’s Place, a family entertainment center featuring everything from go-carts to ziplines to miniature golf (an elaborate laser-tag park is next), could serve as the site of team-building exercises, for example, with the Starting Gate as home for corporate meetings and dinner. Likewise, Sonny’s Place could host a wedding rehearsal dinner while the Starting Gate could be the site for both the ceremony and reception. Such possibilities have already played themselves out, said Stephens, and more are expected in the future as couples, families, companies, and nonprofit agencies discover this remote gem. For this issue and its focus on holiday party planning, BusinessWest takes an in-depth look at the Starting Gate, inside and out, because that’s what’s necessary to grasp the proverbial big picture. As they offered BusinessWest a tour of the Starting Gate facilities, Smithwick and Stephens, who have done this countless times already, started in the bridal suite. But most don’t recognize it as such, Stephens noted, because of its large size and amenities. The bridal suite is the first opportunity for those taking the tour to say ‘wow,’ said Smithwick, adding that there are many others as the visit continues. 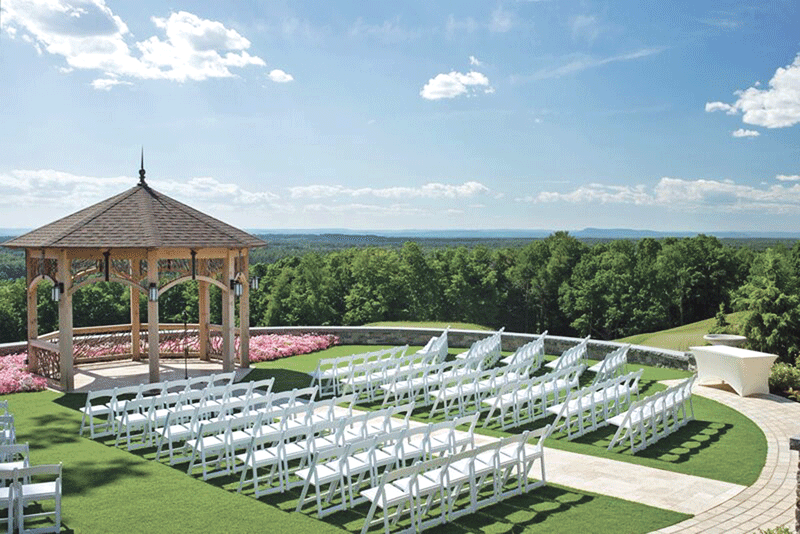 The wedding garden at the Starting Gate, complete with stunning views, has already hosted a number of ceremonies. They include the views from the aforementioned decks, which can be covered during the day and then opened at night to allow views of the stars; the wedding garden, which looks out on the scenery below; the grounds themselves; and the banquet hall (described by Smithwick as a “Colorado-resort-style venue”), which can seat close to 300 for a wedding and can be configured in a number of ways. Eliciting ‘wows,’ not just during tours, but especially during the events themselves, is what the Antonacci family had in mind when it invested more than $45 million in what is now a Hampden landmark, said Smithwick. Indeed, while much of the initial focus in the spring of 2015 was on the golf course — a stunning transformation of the former Hampden County Club track into one of the elite layouts in the Northeast — and the massive stone clubhouse, banquets and events were always intended to be a big part of this business, he explained. Elaborating, he said while the club itself is very private — there’s a huge gate at the entrance at the foot of the hill — the banquet facilities are open to the public. Which means those attending events are treated to the same views — and most of the same amenities — as members. This is how the Starting Gate is marketing itself, said Stephens, noting that these efforts have become quite aggressive through exposure in everything from regional and national wedding publications (and there are many of those) to media outlets in this region and well outside it, with a heavy focus on Boston, Hartford, and New Haven. “We sell it for its view, the fact that it’s a gated, exclusive facility, it’s uniqueness, our innovative event planning, and our food,” said Stephens, noting that such efforts are already generating results, with couples from the Boston area, for example, booking weddings there. But perhaps the best marketing tools available to the Starting Gate are word-of-mouth referrals and first-hand experience, she noted, adding that a good number of inquiries about the facilities have come from those who ventured past that aforementioned gate for an event a month, a week, or even the day before they picked up the phone or ventured onto the facility’s website. While the views and specific amenities elicit the lion’s share of ‘wows,’ Smithwick and Stephens said the ultimate goal is to evoke them through the service and the experience, and the Starting Gate is earning those as well. That one-stop nature of the facilities mentioned earlier is part of this equation, said Smithwick, noting the wedding garden has become a very popular site for ceremonies themselves — he estimates that 70% of the couples have chosento be married in the garden — leaving wedding-party members to walk only a few yards to get to the reception. But beyond convenience and those often-mentioned views, there is a focus on creativity and attention to details that has certainly helped the Starting Gate become a player in a strong field of competitors locally, said Smithwick. “The ability to help a client envision what we can create for them is something we’re very talented at,” he explained, citing, as one example, a client who wanted to do a s’more station for a bar mitzvah. There have been other examples of such creativity, he told BusinessWest, adding that the overall goal is to create events that are unique and memorable. And when it comes to today’s young people and their weddings, this is a must. “What people wanted 10 to 15 years ago from a wedding was something very much traditional,” Smithwick said, acknowledging that he was generalizing and didn’t want to do so too much. “When you look at the modern couple, the Millennial couple, which we’re dealing with a lot, they want something completely different. Summing up what GreatHorse and the Starting Gate will offer those who choose it for an event, Smithwick summoned a word put to heavy use by those in this particular field — an experience. 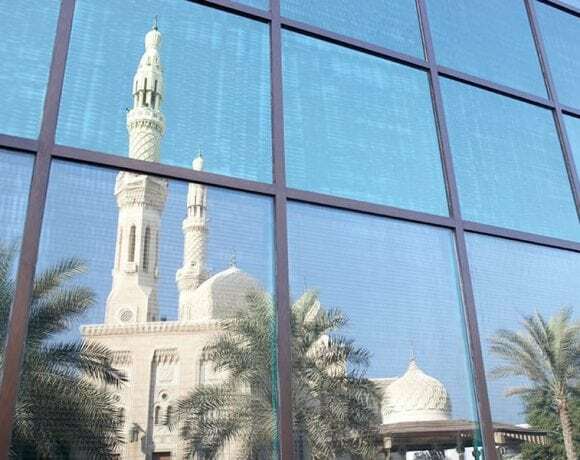 To describe it, he relayed both his perceptions of a visitor’s thoughts and some of his own observations. “It’s a magical arrival — you get to the gate, and you begin climbing, gaining altitude, and you end up on top of the side of this mountain,” he said. “You can see it all in the expressions of the wedding guests; as they make their way down from the parking lot, they stop at the first set of stairs, pause for a moment, and look out over the venue. “This is not your typical wedding venue,” he went on, adding that this magic, as he called it, should help the Starting Gate make tracks in a highly competitive banquet field locally — and perhaps even draw some comparisons, from a business perspective anyway, to another company that uses that word in its marketing. John McClellan Honored by New England Water Works Assoc.